Byroglyphics has found himself in the fortunate position, within the space of a year, of being much in demand and greatly admired. It has been an interesting journey of discovery and self-discovery. The artist launched his career boldly by producing a series of stunning prints that he sold independently through the internet for £15 (including shipping). Very soon, the editions sold out and the Byroglyphics name was out there. From here, he has gone on to produce prints independently and show in several galleries, including his first solo show in Bristol. 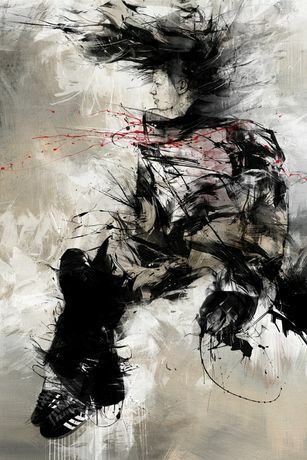 Byroglyphics (aka Russ Mills) is now an artistic force to contend with - already attracting a loyal following. None of this would have been possible were it not for the strength and appeal of the images he produces. Having studied graphic design and experimental film work at Leeds University, he struggled to find a direction to take his particular brand of visual creativity. Eventually he found a niche in illustration. His experience in this field has helped him develop the fluency that is one of the trademarks of his artwork. It also equipped him with a knowledge of and facility with digital technology, which he has incorporated into his creative pallet with ease and aplomb. Influenced by well-known figures on the urban art scene such as Conor Harrington and Ian Francis, he also pays homage to a wide range of artists and illustrators including Ralph Steadman and Robert Rauschenberg. In his first London solo show at Signal Gallery, âDomestic Science'; Byroglyphics is exploring, through a series of large mixed media canvases, the sense of movement and flourish of the figure. These figures are always very contemporary in feel. They seem to float in some incredible technological ether, only fleetingly seen by the observers. They seem to be formless phantoms that are grounded and familiar. The artist sees them as being carried along as if in an endless cycle of technological ecstasy. The confident lines have a freedom and spontaneity, creating an illusion of life and movement. Each works is stunningly beautiful, but as a group in the show, they will surely make a most powerful and memorable effect.